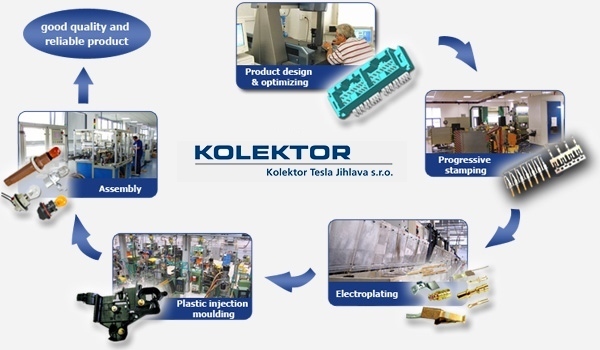 Kolektor Tesla Jihlava s.r.o., a part of Kolektor, is focused on the development, design, manufacture and sale of electromechanical components for the automotive, electronics and electric industries. The company tradition goes back to the year 1958 and since that time not only the manufactured range of products and the complete manufactural technology but also production facilities have been going over big progress. Nowadays the company is situated in an industrial zone of Jihlava – Hruskove Dvory, where the new production and administrative hall and new storehouse were built near the original main building. Our production possibilities start on the development and design. Plastic injection molding is the major production block, we also manage metal stamping and all kinds of assemblies. Our electroplating has multi-purpose equipment for ordinary ways of electroplating. Within the frame of group we are able to ensure the complete product cycle of modern and precission products for automotive industry, electronics and the other industry branches.